More alcohol problems this week. Peter came in vomiting blood yesterday afternoon. 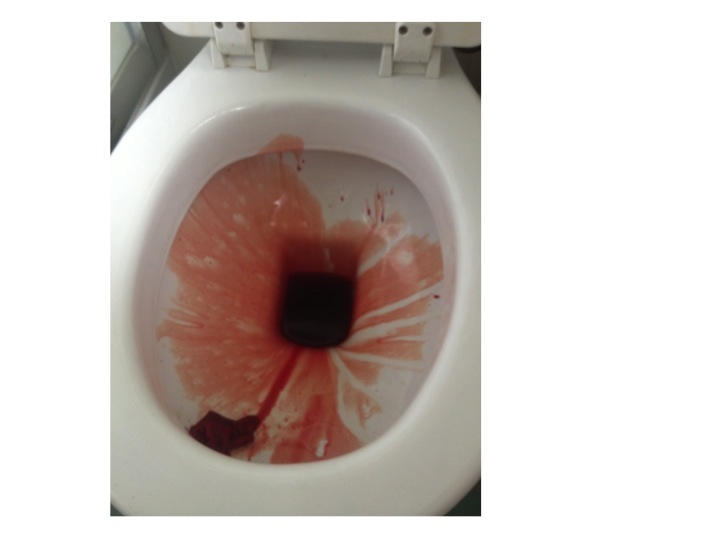 Vomiting blood is always a bad thing, but this time it was particularly bad. His long-suffering partner Rita came in with him to tell us what had happened. Peter, aged 69 was too drowsy and confused to tell the story himself. He was a retired barman and had always drunk too much alcohol. He recently went to see the liver doctors because his abdomen had filled up with fluid. They told him that he would die soon if he did not give up drinking. Rita said that he had cut down but was still drinking about 3 pints of strong cider every day. Yesterday lunchtime he was about to sit down to eat when he said he felt very sick. He staggered to the bathroom and promptly vomited what Rita estimated to be a pint of bright-red blood down the toilet pan. Rita called the ambulance. He vomited more blood on the way and by the time they arrived he was pale, sweaty and quite drowsy. She was really worried – she thought about what the liver doctor had said about Peter dying soon if he did not give up drinking – he had not given up. 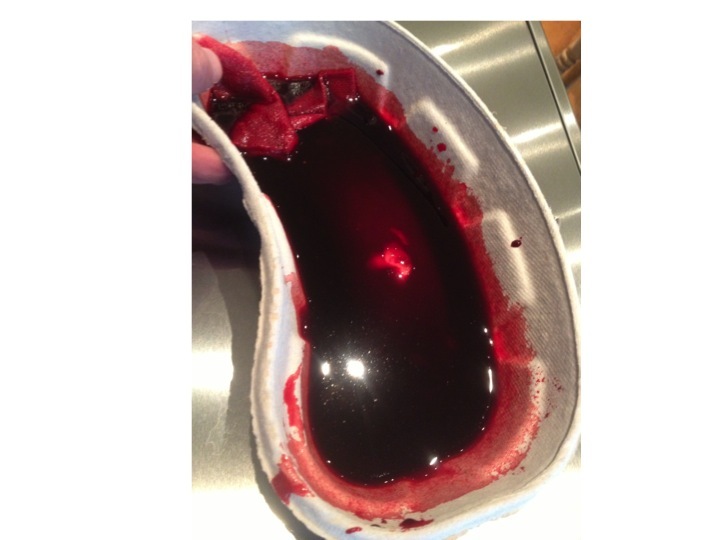 When patients with liver disease vomit blood it always makes us worry about bleeding varices. Varices are large, distended veins which appear at the junction between the oesophagus (foodpipe) and stomach in people with liver cirrhosis. Cirrhosis often results from liver damage due to alcohol. Ethanol is metabolised to ethanal (acetaldehyde) and causes damage to liver cells as well as the pancreas (see vodka and sweetbreads below). The liver does have a remarkable capacity to regenerate. 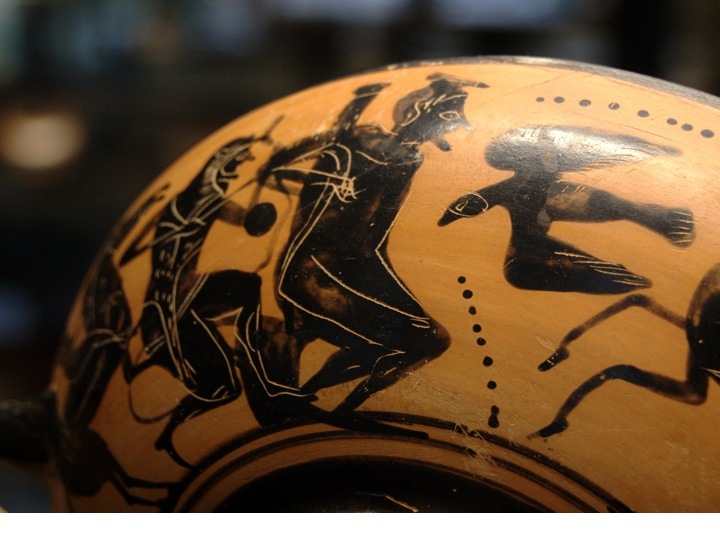 I’m not sure if the ancient Greeks knew about liver regeneration when they devised the myth about Prometheus. He made the mistake of giving fire to men, and as a punishment was chained to a rock for eternity. Every morning an eagle would fly down and peck out his liver. During the following day his liver would grow back again, to be pecked out again the following morning. He is still there. Although liver does regenerate when damaged by alcohol, it does so to form nodules of liver tissue with bands of fibrosis in between the nodules. This disturbance of normal architecture impairs blood flow through the liver. 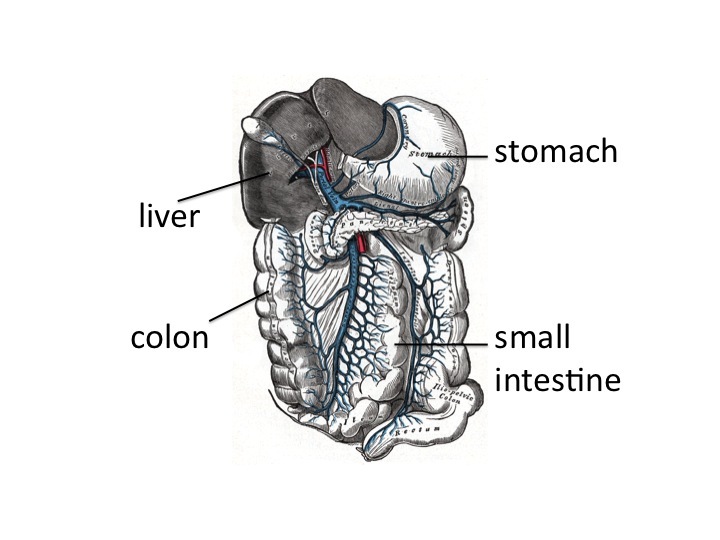 As a result the pressure in the portal veins carrying blood from the stomach and intestines to the liver increases. Increase in portal venous pressure results in oesophageal varices. When they burst, rapid death from blood loss is common. Another result of increase in portal pressure is ascites – fluid accumulation in the abdominal cavity – the cause of Peter’s abdominal swelling. So he was filled up with a blood transfusion, vitamins (see vodka blog below) and given terlipressin – a drug which constricts oesophageal varices and helps to stop bleeding. He was sent as an emergency to have an upper gastrointestinal endoscopy. In fact he did not have significant varices. He had a bleeding duodenal ulcer. The ulcer was cauterised and injected with adrenaline, a biopsy was taken from his duodenum, and he was sent to the admissions unit. Part of the duodenal biopsy was put into a CLO test kit. I talked previously about adrenaline causing muscle tremor and relaxation of bronchial smooth muscle by activating adrenergic beta receptors. It is released by the middle (medulla) of adrenal glands in response to severe stress. The reason Peter was so pale was probably more to do with release of adrenaline than blood loss. This hormone has many other actions to help us survive life-threatening situations. It will also act on beta receptors in muscle blood vessels to increase muscle blood flow – good to get away more quickly from the nasty tiger with dripping fangs that likes to eat humans. Skin blood vessels have few beta receptors – here adrenaline acts on alpha receptors to cause reduction in blood flow. Similarly, in the lining of the duodenum, adrenaline, when injected by the endoscopist, causes blood vessels to constrict and help stop bleeding by acting on their alpha receptors. When I ask students why adrenaline reduces skin blood flow they usually say it is to redirect blood to the central circulation where it is more needed. The skin only has about 1% of circulating blood. It is more likely that skin blood flow is reduced to limit blood loss when the tiger’s teeth finally sink into that tasty human flesh. All this preamble is a good excuse to talk about urea. In our hospital normal blood urea levels are between 3.5 and 6 mmol/l. In the US doctors talk about blood urea nitrogen- the same stuff- normal levels are 20-30mg/l. When Peter visited the liver doctor last month his blood results showed that the concentration of urea in his blood was low – only 1.8 mmol/l (5mg/dl BUN). When he arrived in the ED it was elevated at 14 mmol/l (40mg/dl BUN). His haemoglobin was low at 90g/dl and clotting was deranged with an INR of 2.9. Why was his urea low before and now high? To understand this I need to talk about protein metabolism. Most of us in the West eat lots of protein. More than we need. In the US and UK adults eat about 100grammes of protein/day, although we only need about 50. If we eat 100grammes of protein a day, we need to get rid of the same amount, unless we are growing, body-building or pregnant. Patients who are ill typically break down more protein than they take in – negative nitrogen balance. I’ve used arguments about in/out balance for fluid in my previous post and will use it for energy in future posts. Not everything in humans can be understood in terms of in/out balance. For instance, with my 11 year-old son we input high grade educational material and all that comes out is poo and fart jokes. Casein also used to be used to make plastic items such as buttons. We now have cheaper and better plastics. 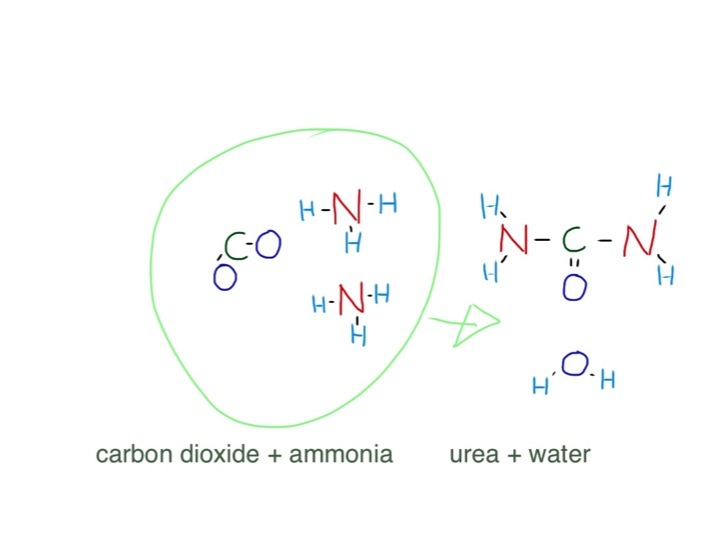 So ammonia is combined with bicarbonate (or carbon dioxide) and via the urea cycle is made into urea, a very non-toxic substance which is excreted in urine. The reason Peter’s urea was so low when he saw the liver doctor was because he was drinking too much alcohol and not eating enough protein. Now he has had a sudden high protein meal – blood. Blood contains about 70g/l of albumin and globulins in plasma, and about 130g/l of haemoglobin (mostly protein) in red cells – total 200g/l. If he has bled a litre of blood from his duodenal ulcer he will suddenly have twice the average daily protein intake in a short time – no wonder his urea level has risen. The reason his INR was raised was because his liver was not producing enough clotting factors. We gave him a concentrate of clotting factors (octiplex) to correct this, and help stop the bleeding. It took a couple of hours before his CLO test result was available. A small piece of tissue was removed from his duodenum next to the ulcer. 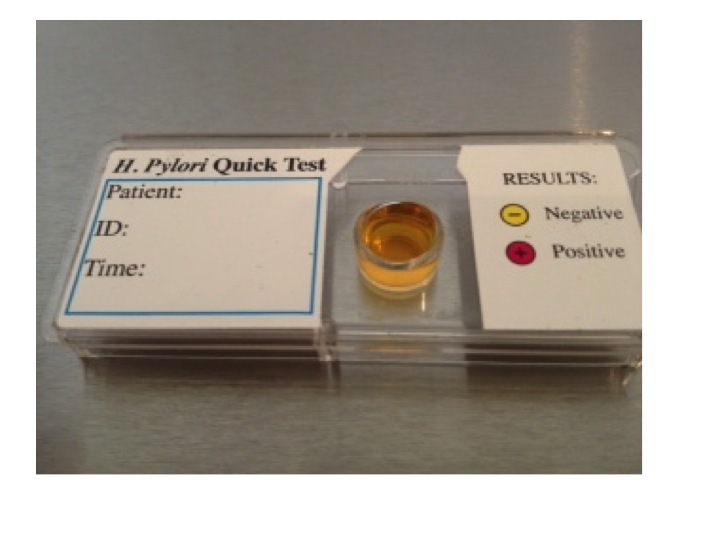 The CLO test refers to Campylobacter Like Organism. Helicobacter pylori is one of these which is a major cause of duodenal ulcers. Helicobacter pylori is an amazing germ. It is a bacterium which can survive in a very hostile environment – the human stomach and duodenum. It is the only germ that can normally survive here. 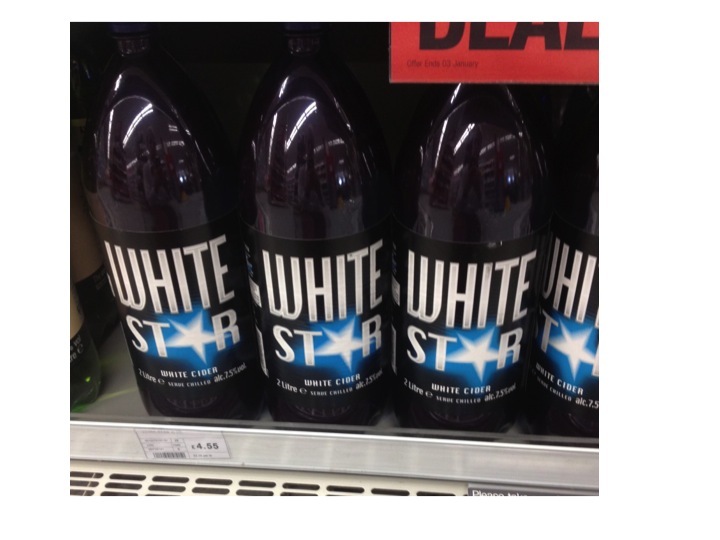 The acidity is fierce, often the pH is down to 1 – really strong hydrochloric acid. There is also a high concentration of nitric oxide and proteolytic enzymes. It doesn’t mind. 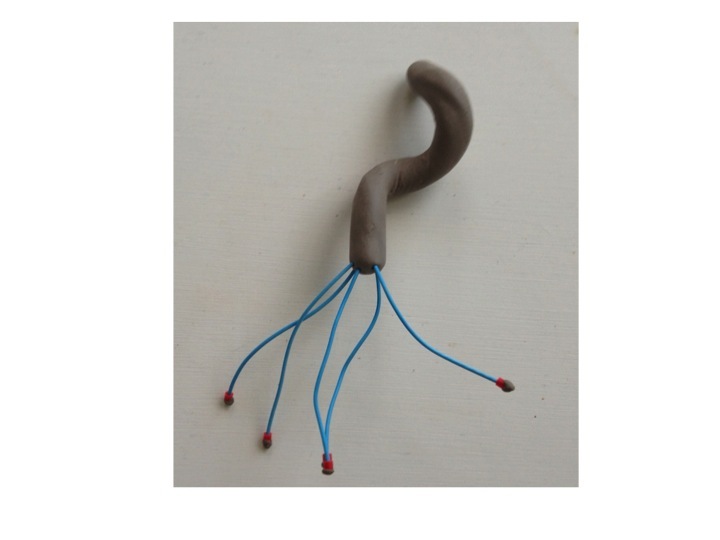 Helicobacter refers to the shape – a helix or corkscrew. I talked before about how bacteria find it difficult to swim in mucus. The stomach lining is covered in mucus, but helicobacter’s corkscrew shape helps it swim in this thick and gloopy layer. Staying in the mucus layer helps protect it from the acid and enzymes. Another protection comes from being able to convert urea into alkaline ammonia – keeping the acidity at bay in its immediate environment. The CLO test simply tests the small bit of duodenum for its ability to convert urea into ammonia – it can only do this if has helicobacter organisms in it. Human cells cannot do this. 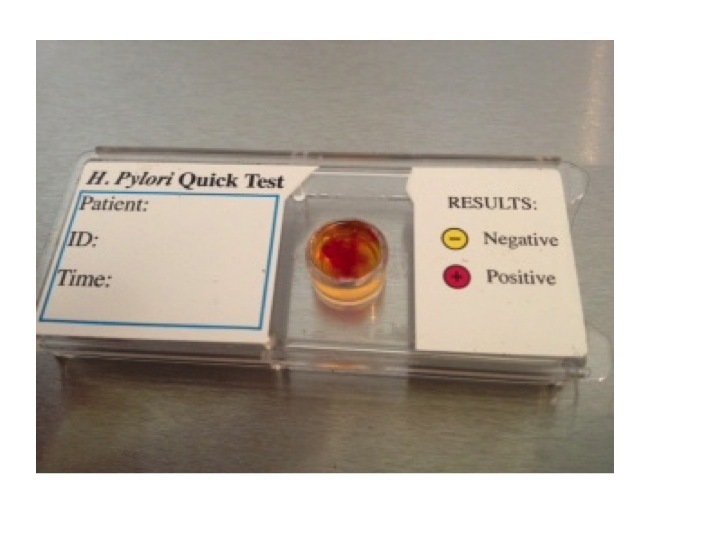 So, in the test plate, there is an indicator, such as phenolphthalein or phenol red which changes colour with alkali. 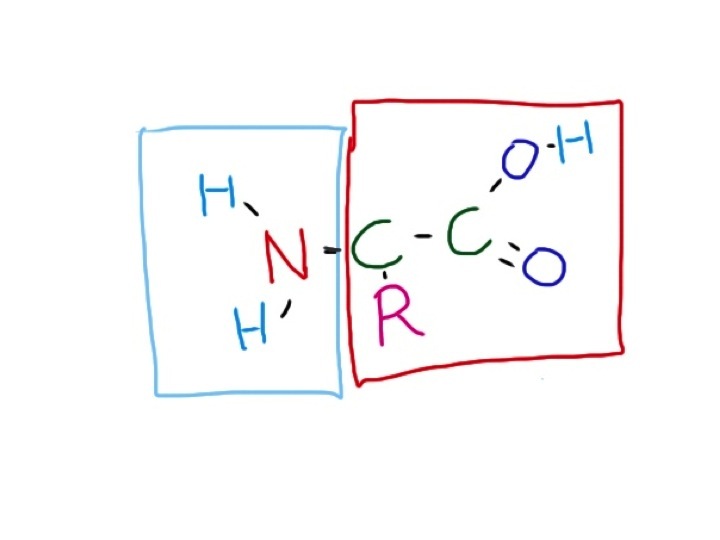 The helicobacter turns urea into ammonia, making the environment more alkaline which will change the colour of the indicator. Phenol red changes from yellow to red with alkali. We gave Peter intravenous omeprazole, a proton pump inhibitor. This stops the parietal cells of the stomach making acid and helps heal the ulcer. We also gave him lactulose. This is a sugar which helps with hepatic encephalopathy. Lactulose is very similar to lactose – the sugar in milk. Lactose is a disaccharide made of the simple sugars glucose and galactose. Lactulose is made of fructose and galactose. I talked earlier (chest pain) about how most of the world’s population have problems drinking milk when they are adult because they have lost the enzyme which breaks down the bond between the two sugars in lactose. No-one has the enzyme to break down lactulose into its two simple sugars. But bacteria do. In the large intestine, lactulose that we have been unable to break down and absorb in the small intestine is turned into lactic acid, which is also then turned into lots of gas, such as methane and hydrogen. Some patients don’t like lactulose because it gives them stomach cramps and makes them fart a lot. But in patients like Peter it is good because the lactic acid reacts with the alkaline ammonia and small amines to inactivate them and reduce their amount in the circulation affecting his brain, making him confused and drowsy. He went home less confused and more or less OK. I hope he stops drinking. This is where the yoghurt comes in. The food link at last. 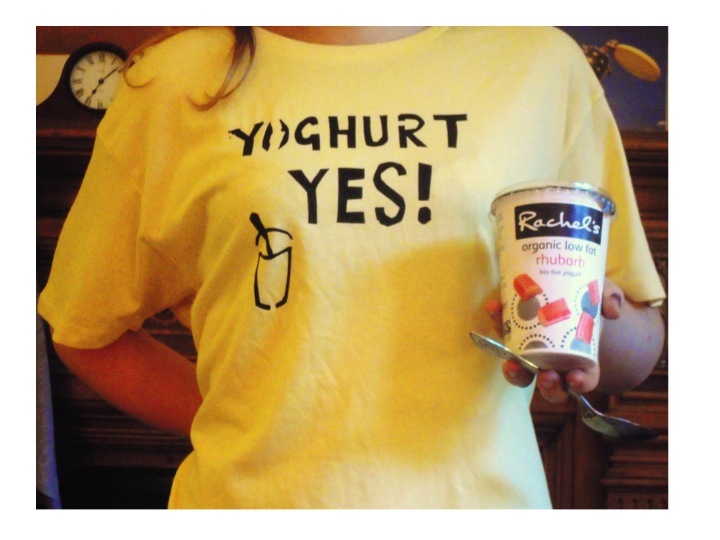 In yoghurt the milk sugar lactose is broken down by lactobacilli to form lactic acid. This gives it a nice tangy taste that my daughter likes so much she wears the following tee-shirt.